Sub-Saharan Africa is the world’s deadliest place to give birth. Each year over a quarter of a million women die in childbirth in the region. 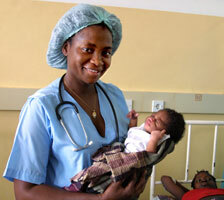 But Mozambique is combating high maternal death rates by implementing unconventional programs. After the country declared its independence from 400 years of Portuguese rule in 1975, a civil war raged for 16 years, killing a million people and wrecking the country’s infrastructure. By the time the war ended in 1992, the health care system was devastated and one in ten women were dying in childbirth. There were only 18 obstetricians for a population of 19 million. Since then, Mozambique has cut the maternal death rate in half. As the figures now stand, the country is one of the few countries on track to achieve the fifth United Nations Millennium Development goal to reduce the maternal death rate by 75 percent by 2015. In 2004, Mozambique introduced a new health care initiative to train midwives in emergency obstetric care in an attempt to guarantee access to quality medical care during pregnancy and childbirth. The film Birth of a Surgeon follows Emilia Cumbane, one of the first midwives-in-training. She performs Cesareans and hysterectomies in makeshift operating rooms in rural Mozambique. We follow Cumbane from her home in the Mozambican capital Maputo, into intensive medical classes, through night shifts in the delivery wards, and watch as she fights for recognition of her surgical competence. With more than half a million women dying in pregnancy or childbirth worldwide, Mozambique’s surgical training programs are being hailed as a model solution in confronting the maternal health crisis facing developing countries. The film captures one woman’s story on the frontlines of improving maternal mortality but it also demonstrates how low-cost, community-based health initiatives are changing the face of public health in Africa. The first class of almost 30 surgical midwives trained in delivery techniques and advanced surgery graduate in July 2008. For the 2009 update, WIDE ANGLE host Aaron Brown travels to a rural hospital in Mozambique to meet with Cumbane to see how both she and the program are faring. Cumbane, now the head of the maternal ward, has a two-week-old baby herself, and Brown explores the successes and obstacles she has faced over the last year, as she has tried to juggle her personal and professional commitments, all the while working to help save women’s lives.